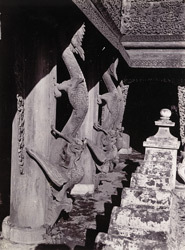 Photograph of carved dragons on the balustrade of the Queen’s Kyaung (Monastery) in Mandalay, Burma (Myanmar), from the Archaeological Survey of India Collections: Burma Circle, 1903-07. The photograph was taken by an unknown photographer in 1903 under the direction of Taw Sein Ko, the Superintendent of the Archaeological Survey of Burma at the time. The Queen’s Golden Monastery was constructed in 1885 on the orders of Queen Supayalat, consort of Thibaw, the last king of Burma (reigned 1878-1885). It was barely completed when she was exiled to India with her husband following the annexation of Upper Burma by the British Empire. Now destroyed, the monastery stood in the grounds of the Royal Palace and was a magnificent wooden building lavishly decorated with ornate woodcarving and mirrored glass mosaic. It was raised on piles following traditional Burmese construction methods and surrounded by a veranda enclosed by carved scrollwork screens. This is a close-up view of the posts supporting the veranda which are decorated with sinuous carved wooden dragons or serpents, auspicious mythical beasts in the Burmese pantheon. These motifs were commonly found on Burmese monasteries. In his account of a British diplomatic mission to the court of Ava in 1855, Henry Yule wrote of another royal monastery: “The brackets or corbels from the outer posts, which support the projecting eaves of the platform above, were griffins or dragons with the head downwards, the feet grasping the post, and the tail rising in alternate flexures, which seemed to almost writhe and undulate as we looked. No art could be better of its kind.” Mandalay was Burma’s last royal capital and was founded in 1857 by King Mindon Min (reigned 1853-78) in fulfilment of a Buddhist prophecy that a religious centre would be built at the foot of Mandalay Hill. As a consequence of royal patronage there were many religious foundations in the city and a wealth of monastic architecture.